Play much StarCraft in your time? I expect that answer to be yes, and that means at one point or another, you were the victim of a zerg rush. Well now you can relive those memories thanks to Google. 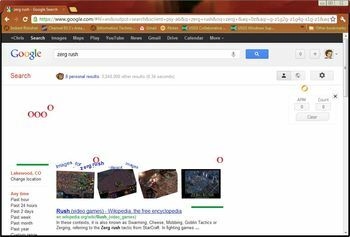 Just go to Google.com and search for Zerg Rush. You will be attacked by red and yellow "o"'s that will destroy your search results. They will come from all over the screen and the only way to stop them is to click on them before they destroy the page. Good luck brave warrior. And yes, I know Zerg should not be a verb, deal with it.